You know how some movies are so good, you want to see them again and again, but just don't have time for it. Director Tom Tykwer has a solution: He tells the same story, three times, in the same movie. 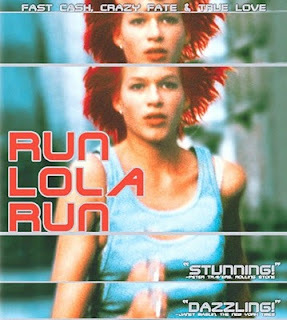 Run Lola Run is a romantic comedy of sorts, about drugs and death and guns and a lot of things, but mostly it is about running. Mostly though, the film is a visual delight which shows great skill and playfulness from the director, as he plays with expressions and genres. So much so that Quentin Tarantino (the constant kleptomaniac he is) stole an idea or two and used it in the overpraised Kill Bill. I'll leave it up to you to spot those for yourself.